Eighteen-year-old Declan Rice is one of seven players to be nominated for the Premier League 2 Player of the Month award for October. 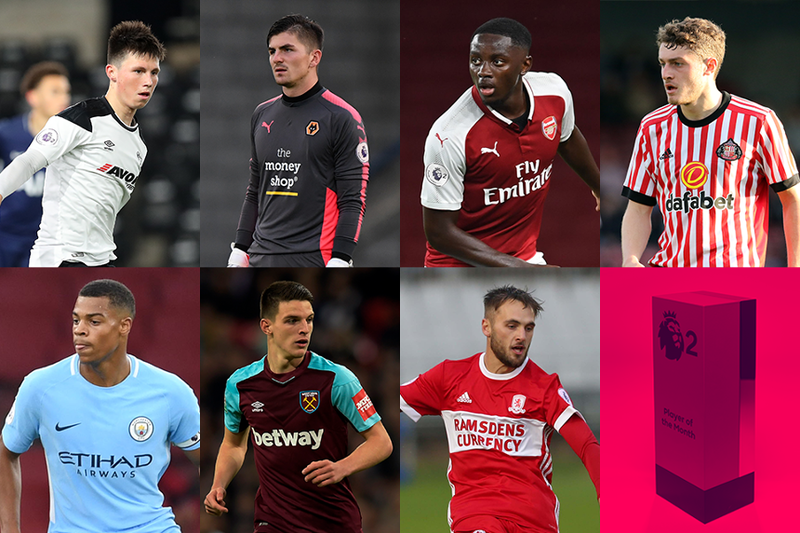 The shortlist was selected by the Premier League Football Development panel after PL2 club managers nominated the best individual performance from each of their opponents during the month. The winner will be announced on 10 November. Babos contributed to an impressive month for Derby, scoring in the 2-0 win over D1 leaders Liverpool. The 19-year-old also assisted Luke Thomas's winner in a 1-0 victory over Tottenham Hotspur. Wolves did not pick up points in October, but goalkeeper Harry Burgoyne excelled with impressive displays against leaders Middlesbrough, Fulham and Aston Villa. The midfielder helped Arsenal, fifth in Division 1, to beat Sunderland 2-0 before setting up a goal in the 2-2 draw at Chelsea. He also came on as a substitute to help inspire the 2-1 comeback victory over Norwich City in the Carabao Cup. Embledon set up the only goal in Sunderland's 1-0 victory at Everton on 20 October. Nmecha, a hero in England's UEFA Under-19 Championship final triumph this summer, scored a hat-trick in Man City's 4-1 victory over Derby. The centre-back helped West Ham to a 4-2 PL2 victory over Manchester United and a goalless draw at Chelsea as they rose to fourth in Division 1. He also played the 90 minutes of the 3-2 Carabao Cup victory at Tottenham Hotspur and came off the bench in a 2-2 Premier League draw at Crystal Palace. Wing was a standout performer as Middlesbrough stayed top of Division 2, getting a goal and an assist in a 3-1 win over Wolverhampton Wanderers. He scored in a 2-2 draw at Brighton & Hove Albion and got another goal and assist in the 4-3 loss to Reading. The 22-year-old also helped Boro win 3-0 at Nottingham Forest in the Premier League Cup.